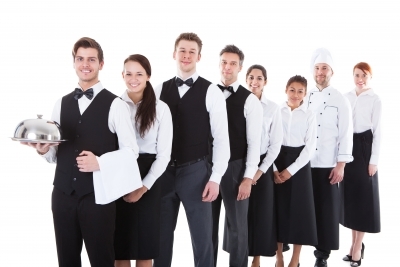 Find out the benefits of using temporary Catering staff. Starting up any business is tough, but opening a new restaurant can be particularly so, especially in London. With dining out now something most people enjoy on a regular basis, consumers are demanding more and more from their meals out, which mean competition between restaurants, is as fierce as ever. Staffing is often cited as being the biggest challenge that new restaurants face. It’s essential that you build the right atmosphere, which is why as the public face of the restaurant, employing the right staff is vital. Your food may well be Michelin standard but if diners aren’t getting the very best customer service, then making your restaurant successful will be an uphill battle. With good quality catering staff becoming increasingly difficult to find, more and more savvy restaurant start-ups are turning to temporary catering staff to get their restaurant off to a flying start. When you’re opening a restaurant, there’s a myriad of things that you have to ensure are 100% right, sometimes it can seem like there is not enough hours in the day. With top quality catering staff being harder and harder to find, recruitment can be a huge drain on your time, especially if you’ve not done a lot of it in the past. From advertising the vacancy, sifting through CVs and then arranging interviews, the process can be exhausting! A good catering recruitment agency will have access to a select number of highly qualified and experienced catering staff who can start at short notice, giving you peace of mind and letting you get on with other important tasks. Nobody knows how successful a restaurant will be in its first few months. Some may find themselves busy almost straight away, whereas others may start off very quiet, gradually building a good customer base. There’s no right or wrong way and some of the most successful restaurants in London struggled in the early days. When you’re unsure of customer numbers and your optimum staffing levels, temporary staff can give flexibility both in terms of staff number and in terms of money. Sudden fluctuations in bookings? With temporary catering staff, you’re covered. The great thing about temporary catering staff is that if you’re really impressed with certain members of the team that you’ve been supplied, you’re free to offer them a permanent contract if you so wish once their temp contract is up. Using temporary catering staff in this way can give you an almost risk free way of assessing new staff and building the high quality team that your restaurant deserves. Over time, you’ll begin to get an idea of your optimum staffing levels and many of your temporary catering staff will become parts of your core team. But that’s not the end of the usefulness of temporary catering staff. As you grow your business, access to highly qualified and experienced staff will be vital and will help your business grow organically and with a tight rein on the purse strings. * 07495 574 923 for temporary front of house or kitchen porters.